Morality is a function of the brain. When we make a distinction between matters of the heart and head, we are in fact distinguishing two modes of thinking that take place in our brains: System 1 thinking, which is fast, emotional, and intuitive (heart), and System 2 thinking, which is slow, rational, and deliberative. Daniel Kahneman beautifully describes these two modes of thinking in his book Thinking, Fast and Slow. Both modes are useful, but they are best suited for different tasks. In some situations we should go with our hearts (or guts, as in “gut feelings”), and some require the higher-order rational thinking that the prefrontal cortex (PFC) evolved to handle. 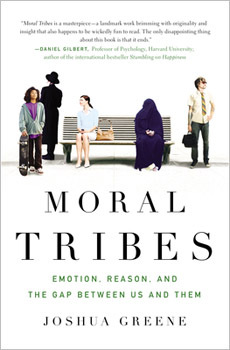 In his book Moral Tribes: Emotion, Reason, and the Gap Between Us and Them, Joshua Greene, who heads the Moral Cognition Lab in Harvard University’s department of psychology, explains how this distinction applies to morality. The moral sense that we feel in our guts and experience intuitively is a product of System 1 thinking. Some things just feel wrong and others just feel right. This moral sense evolved in our species to enable cooperation within groups. Social cooperation created an Us (our tribe) that could better compete against Them (other tribes). This automatic sense of morality takes on somewhat different forms from tribe to tribe (i.e., cultural groups, including distinct subcultures within societies, such as liberals and conservatives), but it is largely universal in nature, dissuading us from cheating our neighbors and killing our friends. Because it evolved to help us compete against other groups to give us an advantage for propagating our own kind, this moral sense pits Us against Them in a way that complicates matters in the modern world. The kind of morality that is needed to embrace a global Us is a product of System 2 thinking. Just as we need to know when to shift into System 2 thinking to solve our personal and group problems, we must do the same to solve our global problems by creating a shared metamorality for the modern world. The human brain is like a dual-mode camera with both automatic settings and a manual mode. A camera’s automatic settings are optimized for typical photographic situations (“portrait,” “action,” “landscape”). The user hits a single button and the camera automatically configures the ISO, aperture, exposure, et cetera — point and shoot. A dual-mode camera also has a manual mode that allows the user to adjust all of the camera’s settings by hand. A camera with both automatic settings and a manual mode exemplifies an elegant solution to a ubiquitous design problem, namely the trade-off between efficiency and flexibility. The automatic settings are highly efficient, but not very flexible, and the reverse is true of the manual mode. Put them together, however, and you get the best of both worlds, provided that you know when to manually adjust your settings and when to point and shoot. The rational means that Greene proposes as the basis for System 2 (manual camera mode) moral thinking is an old philosophy with an unfortunate name: utilitarianism. Despite the name, utilitarianism doesn’t frame life in cold, mechanistic terms, but strives to achieve the greatest life experiences for the most people possible without partiality. It is its impartiality that allows us to exceed the boundaries of our separate tribes. This 19th century philosophy of Jeremy Bentham and John Stuart Mill offers new hope for our species to shape a truly moral world. Moral Tribes is an important book. This is not merely because it is thoughtful, well written, and innovative, but also because it teaches a lesson that we desperately need to learn. Despite tremendous historical strides in reducing violence in our world, our potential for doing harm to the earth and one another due to the power of our modern technologies is far greater than in the past. We who work with information technologies dare not ignore the concerns of morality by compartmentalizing them as irrelevant to our work. What we do with information has a moral dimension that is considered far too seldom. The moral thinking that we need today is not the morality of our forebears. We owe it to future generations to get this right. Thanks for this insightful post. I’ve already linked this article into discussions that deal with something totally different than data visualization … and I think it gets people enlightened.